Big boy and Fat boy, originally uploaded by GrahamKing. In New Mexico, between the artists’ towns of Santa Fe and Taos, we visited Los Alamos, home of the atom bomb. The Manhattan Project was based here, where the first atom bomb was developed between 1941–1946. 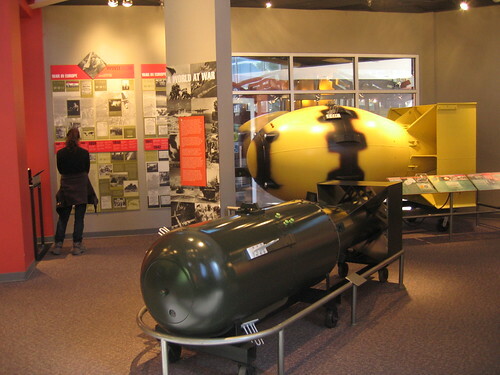 In the picture are replicas of Big Boy and Fat Boy, the bombs which were dropped on Hiroshima and Nagasaki in August 1945, representing the successful outcome of the Manhattan Project. Today the Los Alamos National Laboratory still controls most the the town and hills around it. There is a security checkpoint on the highway coming into town, and pretty much everyone in town works for the laboratory. This results in Los Alamos being the best educated community in New Mexico, and some great museums. Aside from the Bradbury Science Museum, pictured, there is a museum about life during the Manhattan Project. The army forcefully acquired the land from a private school for teenage boys. Because a staff list would of shown a suspicious concentration of atomic scientists the staff were given new driving licenses with only numbers in them. This must of confused the local police, who were not told about the project. Displays in the Bradbury museum wrestle between the bad of atomic weapons and the good of ending World War II (although the war ended in Europe in May 1945, three months before the bombs were dropped), but never convince themselves – the guilt they feel really comes through. The laboratory is making great efforts to clean up the waste generated during the project and afterwards, and casually dumped before the dangers were well known. They also do lots of non-atomic science, and have some fantastic exhibits about radiation. 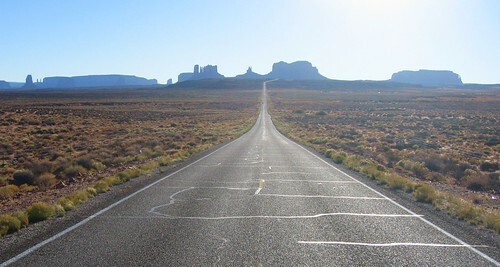 The road to monument valley, originally uploaded by GrahamKing. On the Utah / Arizona border, in the distance is the iconic Monument Valley. It’s appeared in many Westerns, Marlboro adverts, 2001, and other some such. Follow the link for the Wikipedia page with photos – you’ll recognize it straight away. I found it a little underwhelming in person, although still photogenic. It’s large red rocks in a large plain of desert and scrub. So is most of the Southwestern United States. The whole area is in a Navajo Reservation, which didn’t seem to make any difference to us driving through, buying gas and snacks, taking photos, and, euh, leaving. You don’t enter into the subtleties of tribal administration when you have to get to Colorado by nightfall. 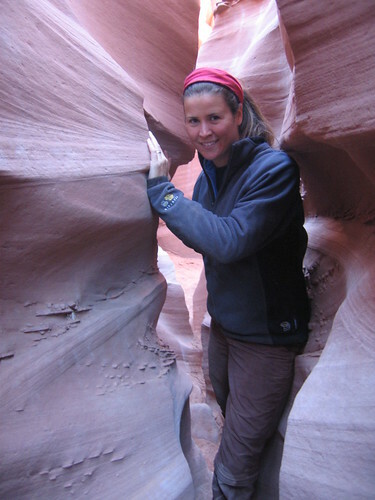 Slot canyons of the Escalante, originally uploaded by GrahamKing. In Southern Utah we went almost 30 miles down a dirt road in Grand Staircase National Monument, to find these amazing slot canyons. We luckily had some great information (thanks Scott! ), as they are hard to find. 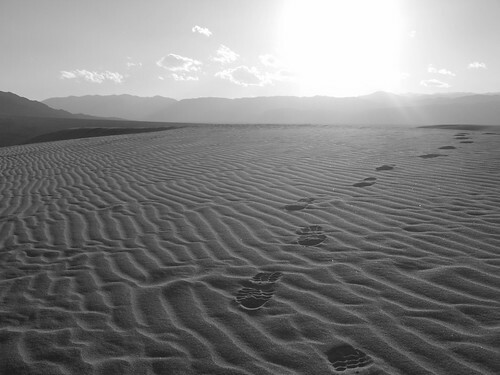 You walk / clamber up one canyon, get out the top into the desert, and come back down a different one. They get narrower than in the picture, and often we could only just squeeze past sideways. One of the most amazing experiences of the trip! Springdale’s Beer and Gear benefit event, originally uploaded by GrahamKing. Internet access in Africa was sporadic, and in India every street corner has an Internet cafe. In America everywhere had WiFi, but you are expected to bring your own laptop. A few coffee shops had a computer we could use, but by far the best choice are the public libraries. On a visit to Springdale, the nearest public library to Zion National Park, we learn about their upcoming Beer and Gear Festival. The library was trying to raise money to get some solar panels and an exhibit to teach people about solar power. The festival was several bands, a local brewery tent, a bit of food, free massages from massage school, and a hiking equipment auction. 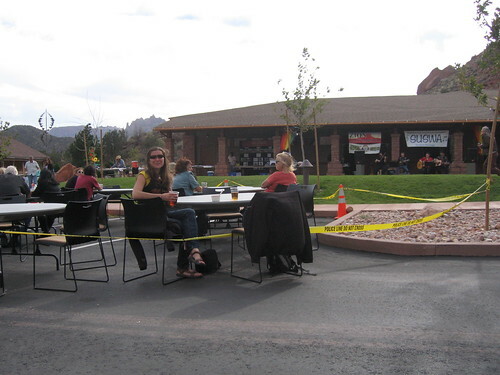 The beer was very good (4%, the legal limit in Utah), the music not bad, the massages great, and the atmosphere wonderful. Go Utah! Later, at the Beer and Gear benefit. 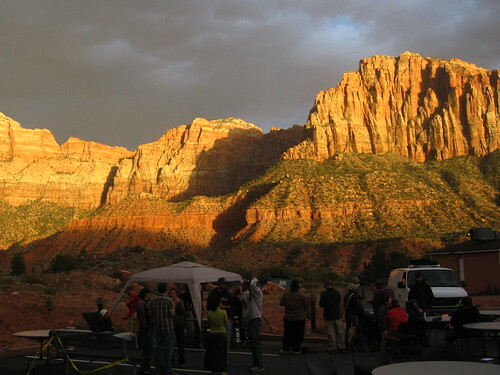 Postcard from Zion, originally uploaded by GrahamKing. Zion National Park, in Utah. What a pretty pretty park. Cars are not allowed very far in. All transport is by shuttle bus, which keeps the park quiet, and allowed us to go to a beer festival (yes in Utah!- pictures coming soon). If you’re wondering why there are all of a sudden lots of pictures on this blog, it’s because I’ve discovered Flickr’s ‘Blog This’ feature. We’ve been uploading pictures to Flickr regularly for a while, and they show up on the right hand side, but I realised I write more in the Flickr picture description than here, so now I can link the two. Yee-hah! You can always click the pictures and select ‘All sizes’ if you want a large version. Angel delight, originally uploaded by GrahamKing. 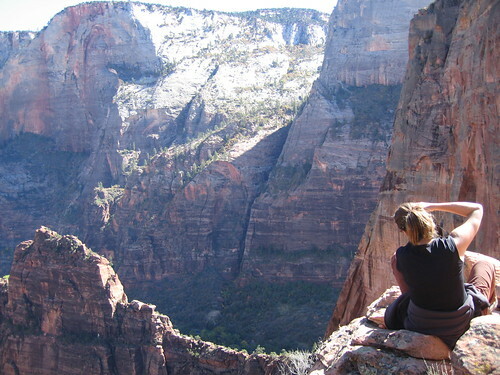 On top of Angels Landing, Zion National Park Utah. 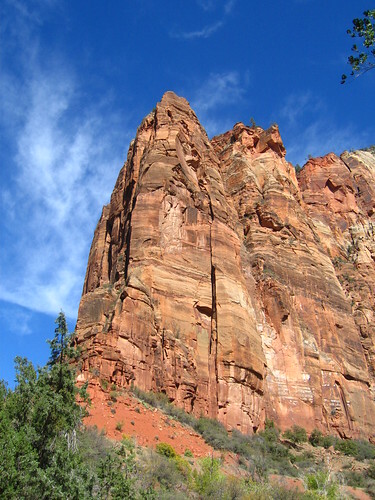 This is an amazing trail that goes out onto a high rock promontory in Zion Canyon. The last section is on a very thin ridge with sheer drops either side. The views are well worth the risk. A view of nothing, originally uploaded by GrahamKing. 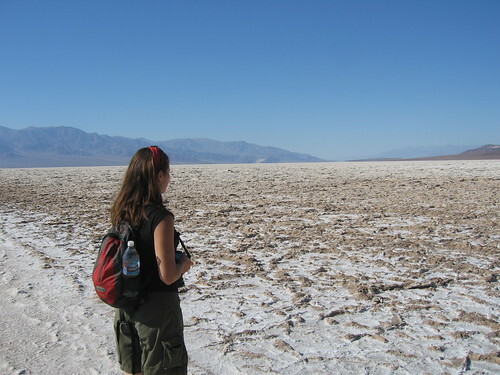 Our last view of California was here, Badwater in Death Valley National Park, the lowest and hottest point in North America. We’ve been back in Pasadena for a little while now, and I’m gradually uploading photos from our road trip in the American South West. Here are two pictures I am particularly pleased with. 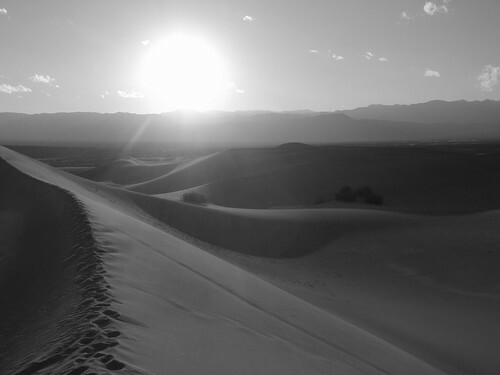 Both taken on a sand dune near Stovepipe Wells, Death Valley, California. …is the name of the multi-agency park access card we bought for $80. In practice this means we can go to any National Park, National Forest, State Park, Country Park, anything owned by the Bureau of Land Management, or any of a variety of other conservation / management agencies. There’s a lot of land protected out here. In fact there’s a lot of land full stop. We drove up from Pasadena to Sequoia and King’s Canyon National Park to see the most massive trees in the world, particularly the largest organism in the world, General Sherman. Then up to Yosemite, where we got snowed in. They closed the access road we camped off of. In practice this worked out great because they salted the road but didn’t officially re-open it, so it was only accessible from our campsite: Yosemite just for us! Next we drove down into the Eastern Sierras valley, to enjoy some hot springs (clothing optional – it’s California innit) and see the oldest living organisms, the Bristlecone Pines. The tallest tree is up in the North of California and the widest in Oaxaca, Mexico, so that’s the end for the records. We drove through Death Valley, which really is as dry and dusty as it sounds, through Vegas, and we are now in Zion National Park, Utah. I’m writing this from the Springdale library, a lovely new building with over 12 computers, charging $1 a day for Internet access. And some books and stuff. The amount of space out here is amazing. We’ve driven for hours on a straight road, with just dusty scrub-land on either side. Luckily we have a 40 hour / 32 CD audio-book of Don Quichote to listen to. Gas is cheap, our S.U.V. is massive and comfortable, the food is plentiful, filling and cheap, the people are friendly and helpful, the landscape is amazing, the local beer is good, and just cos I can, I might just go out to a range in the desert (which is everywhere), and fire some really big guns. God bless America the Beautiful! We’re hoping to head to Arizona and New Mexico on Monday.